HÀ NỘI — The Ministry of Agriculture and Rural Development (MARD) has sent an urgent message to the Peoples’ Committees of cities and provinces, urging them to prevent illegal forest destruction. According to the MARD, positive changes have been made in the forest protection work in recent years. The number of forestry law violations and the damaged forest areas have been decreased nationwide. But there are still violations in a number of areas including Đắk Lắc , Đắk Nông, Kon Tum, Gia Lai and Quảng Nam. Violations are detected too late and aren’t strictly handled, which causes public concern. In order to prevent illegal deforestation, the Minister of Agriculture and Rural Development Nguyễn Xuân Cường, asked the chairmen of provincial People’s Committees to adopt a number of measures including reviewing the forest destruction spots, investigating and strictly punishing cases of deforestation in accordance with State regulations as well as publicising the settlement to the public. The minister asked provincial leaders to impose strict punishment on forest owners, individuals and organisations responsible for forest protection and management; and authorities who do not detect and prevent cases of deforestation in a timely manner, the minister said. He also asked the provincial People’s Committees to assign local authorities to take responsibility for State management of forest and forest land. In addition, wood processing facilities should be strictly managed and the origins of wood reviewed to ensure it was legally obtained. Localities were required to suspend facilities who had breached the law and eliminate businesses who trade forest produce illegally. Provinces and cities were ordered to review the operation of the forest ranger force to raise its effectiveness. Unexpected inspections on the force’s activities should be intensified while irresponsibility or failure to fulfill the assigned task should be penalised. In the meantime, it was necessary to spread information regarding outstanding examples in the forest protection work, raise awareness among local residents on forest protection and development as well as advise them against forest law violations. In a related news, nine forest rangers from Cư Jút District Forest Protection Division in the Central Highlands province of Đắk Nông were on Thursday disciplined for mismanagement and irresponsibility. Their actions allegedly resulted in the illegal logging of hundreds of cubic metres of timber. Among the errant rangers are the head and two vice heads of the Cư Jút District Forest Protection Division---Trần Văn Giảng, Lê Lam Sơn and Hoàng Thiết - as well as the head of Đắk Wil District Forest Protection Division, Hồ Trường Sơn. Lê Trọng Yên, director of the province’s Agriculture Department, said on Thursday besides disciplinary action, the rangers may face criminal charges after police complete their investigation into the large-scale illegal logging operation that came to light late last month. On April 27, police and border guard officers in Đắk Nông found 40.2cu.m. of timber being carried away in two trucks at some 3.40am from the Yok Đôn National Park on the border of Đắk Nông and Đắk Lắk provinces. The two truck drivers - Trần Lưu Lân and Hồ Trọng Dũng - failed to present legitimate documents specifying the origin of the timber. They told the police that the timber was being taken to a workshop of Long Vũ Company in Cư Jút District specialising in the production of wooden products. The company is owned by Phan Hữu Phượng, known as “Moustache Phượng”, a resident of EaT’ling Town. Investigators searched five locations where the illicit ring stored their timber and confiscated nearly 210cu.m. of wood as well as multiple trucks, cars, tractors and chainsaws. 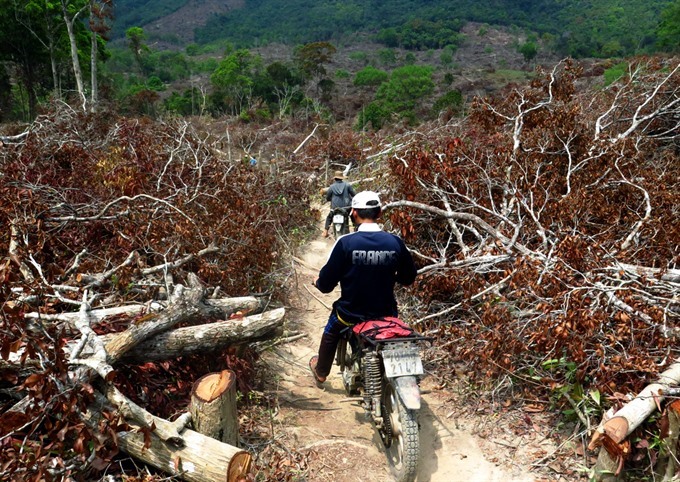 On May 3, Đắk Nông Police initiated legal proceedings against five members involved in the large-scale illegal logging operation headed by Phượng.